The music and recording industry is changing (and it always will be.) But the question I seem to hear the most, “is it for the better or for the worse?” I like to take a positive approach and I think it will be for the better. Things in the consumer and creative world usually change because ultimately people want them to. The ones who jump in and help to craft the changes can also reap the benefits, in my opinion. 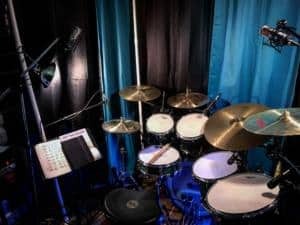 This brings me to my next point… Having a good sounding instrument (for example, a well-tuned drum and nice cymbals or a good guitar amp and tuned guitar) is a priority over buying some of the fanciest preamps or microphones. This is also the same for the player… Make sure you can play the part correctly and in time. You hear far too many stories of bands going into the studio and spending a bunch of money just to figure out their songs aren’t fully written, their kick drum pedal squeaks, or they simply can’t play to a metronome. My recommendation is to master your instrument and make your performance sound good first and then the recording and gear are secondary and will become much easier. I have heard some amazing instruments sound great through a basic rack interface and simple dynamic microphones. I recently made a drum cover video of “The Middle” by Zedd, Maren Morris, and Grey. (Watch on YouTube.) I really like the production of this song and I also enjoyed playing drums on it. So, I decided to set up my mikes, camera and hit the little red record button. A big thanks to Jerome Giancola for mixing the drums and the tracks together (Check out his studio site). Jerome and I played together during Ringling Bros Circus and he is not only a killing bass player but an excellent audio engineer. He is currently working in the New York City area and I highly recommend him for any project! (Remember… remote sessions.) A lot of times I will record a project with Logic Pro X and then I can zip it and send it to anyone to record or mix the session. Jerome and I have been working this way for a few years now… Whether it is mixing drums or him just laying down some bass on one of my original tunes, it works perfectly! Remote sessions allow you to work with musicians and producers from anywhere in the world. So, I think this is a positive move for the modern recording industry. Jump in or get stuck in the past! ← Definiteness of Purpose – What are we doing?